This course provides current information about computed tomography imaging of the body to include the following categories: Basic Concepts, Chest CT, Abdomen and Pelvis. Information is provided regarding the sensitivity of CT, scanning protocols, and appropriate and inappropriate applications of CT screening. Radiation protection in CT imaging is a necessary component of any imaging course and is included as an appendix to the reading reference. 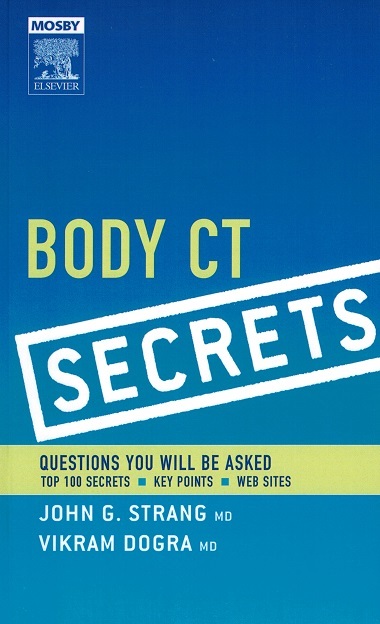 This course is based on the textbook, Body CT Secrets by John G. Strang MD and Vikram Dogra MD, © 2007 and a supplement titled Radiation Protection and CT written by Jeana Fleitz, M.Ed., RT(R)(M). This course has a corresponding posttest containing 120 multiple choice and true/false questions.